This is a theme park where we had lots of fun and joy. This place was crowded since it was a holiday season. Those who want to avoid long queue can go for the Express pass, if required. Click here for Riders Guide. Before going for ride (especially roller coaster type of ride) make sure to keep all the valuables and other loose objects in the digital locker. It is free for first 30 min after which you have to pay. We were the first to be on the queue in the morning for Madasgar Crate adventure. We thoroughly enjoyed this river ride and are sure this will entertain people who are fond of cartoons characters. Those who are scared of Roller coast can try this. A very scary and fun indoor ride. Wow! what a fun we had in this roller coaster with lots of twists, sudden movement front and back with special effect in the dark room. Hmmmm also it was really scary :D.
Don't miss this special 4D roller coaster stimulator which have spinning, whirling and twirling experience. Consists of 2 rides namely Human and Cylon. 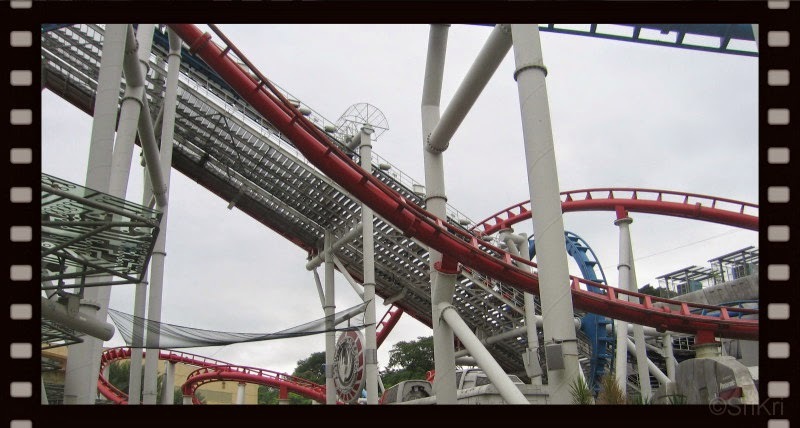 The difference is that in Human is the traditional roller coaster but in Cylon your feet will be hanging in the air during ride. Was little nervous to try this ride. But our little niece wanted to try both the rides. So we agreed to try. First went to Human and then to Cylon ride; must try rides (try both Human and Cylon ride. It's fun). Better not to eat anything before going for this ride as you may feel like vomiting. 3D glass are provided to view the Fairytale of Princess Flona and Shrek in 4 D. The seats joggle, jiggle and other effects for 4D experience. A legendary film director Steven Spielberg takes you to the Hollywood area (wait wait wait, not in reality, its only in screen ;)). It demonstrates behind the scenes in the Hollywood movie as how the water, fire and ruining effect are shot when major hurricane hits (Set was of New York). Some Hollywood characters roam and entertain you here. Take your camera for click click click..
One can feel the spirit of New York when strolling through this place.